Sometimes you may have a need to embed a PDF file within the Excel workbook. This could be the case when you are creating a catalog and want to embed product specific PDFs. In this tutorial, you’ll learn how to embed a PDF file in an Excel Worksheet. Go to Insert tab and click on the Object icon in the Text group. This will open the Object dialog box. In the Object dialog box, select the ‘Create New’ tab and the select ‘Adobe Acrobat Document’ from the list. Note that you need to have Adobe Reader installed on your system for Adobe object to appear in the list. Check the option – ‘Display as icon’. Select the PDF file that you want to embed and click on Open. These steps would insert a PDF file in the worksheet. As soon as the PDF is inserted in the worksheet, it also gets opened by default. You can close the PDF file and continue to work with Excel. The PDF icon inserted using the above steps is an object (just like charts or shapes) and you can resize it and place it anywhere in the worksheet. To insert multiple PDFs, follow the same steps (as shown above). 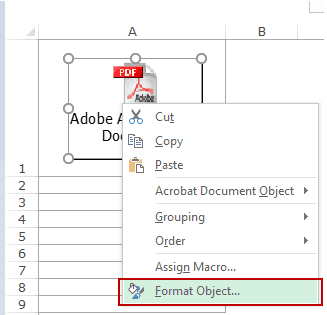 When you embed a PDF file in Excel, it is inserted as an object that sits above the worksheet cells. The position of the icon would not change if you change the cells below it. For example, when you place the icon within a cell, it would not move with the cells and would not get filtered, sorted, or hidden with the cells. As shown below, if you hide the cell that has the PDF file, it doesn’t hide the PDF. Insert the file icon within the cell. 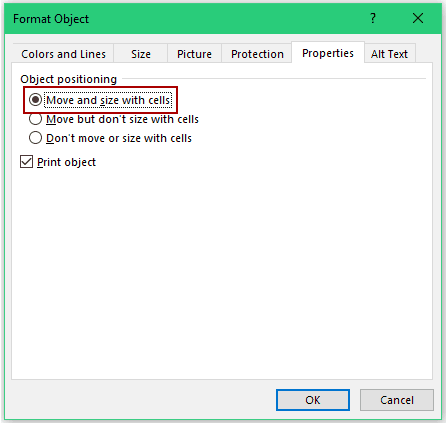 If it doesn’t fit, either resize the icon or the cell so that the icon is within the cell. Now when you filter or sort/filter the cells, or hide the rows, the PDF object will do the same. 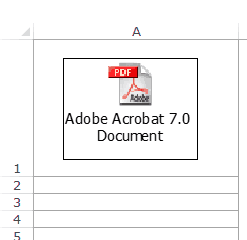 When you embed a PDF file in Excel, it gets a generic name such as “Adobe Acrobat Document”. 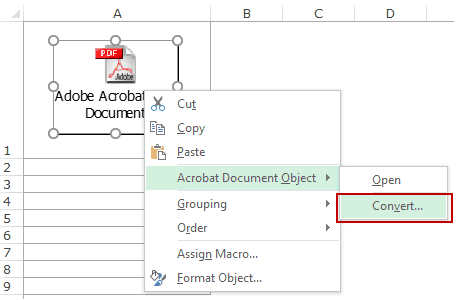 Right-click on the PDF object and select Convert option in the Acrobat Document Object. In the Convert dialog box, click on the Change Icon button. 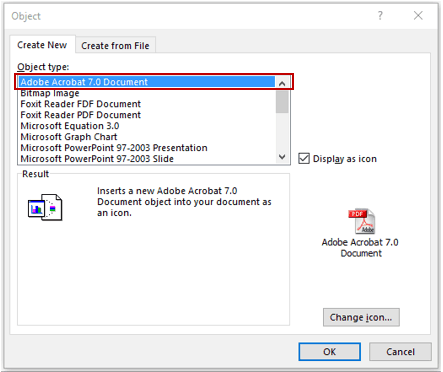 In the Change Icon dialog box, change the caption to the name you want for the embedded PDF document. This will change the name of the embedded PDF file. Want to convert PDF files to Excel? Check out my tutorial where I show the exact steps to convert PDF files to Excel. Valuable information. Thanks for the sharing. For someone who want to convert PDF to Excel for editing, I’d recommend Acethinker PDF Converter Lite, free and works fairly well for me. Thank you so much, I was struck in the work, This website helped me a lot. That was exactly what I was hoping to learn and will help me so much at work. Very helpful video and nice, clear instructions. Thank you!!! Hi is there a way to save the embedded file to the excel sheet so that we can open those files in any computer systems. ?? Now i would like change it into Millions and thousands . Is there a reason to imbed an icon rather that just have a hyperlink to the file? 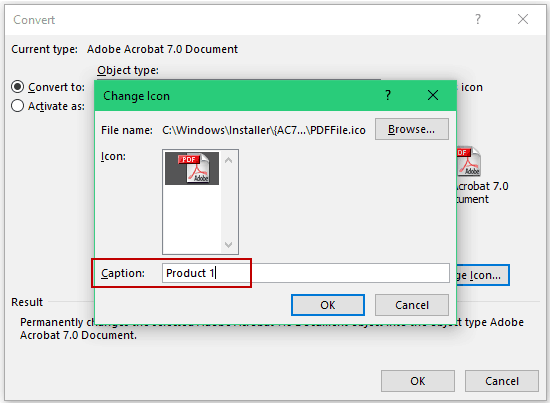 Hello Robert.. With icon, the PDF becomes a part of the Excel, while in case of hyperlink of a PDF that is stored on your system, the link may not work if you share the file with someone. Is there a way to do this in Excel for Mac 2011? Hello Richard.. I am sure there is a way. Sorry I don’t have a Mac to test it.